Today we are going to talk about something potentially embarrassing, but hey I have no shame. But I believe this is a cool thing because I talk about stuff A LOT of people have been through, but few are bold enough to talk about let alone post it in a blog for all to see. Want to know who people really are? Three ways. One. How do they act when they have everything? Two. How do they act when they have nothing? Three. How do they act (respond) when the proverbial caca hits the fan? For the purposes of today’s blog, I’m interested in number three because it involves a lot of number two (the stinky kind). Before we start though, we must understand that…. I’d love to say that every time some land mine blew up in my face that my response soooo perfect that Mother Theresa was looking down gettin’ all jealous. That I handled said caca with grace, maturity, kindness, love, yoga, bible study and inspirational quotes. That my response did NOT involve a hell-mouth opening beneath my feet and then spewing out of my mouth. That my reaction did not involve a blast radius. But one thing I promise on this blog is honesty. One thing we must learn to be successful in this profession (or any other) is to forbid outside circumstances to own, control or derail us. Sounds easy in an inspirational quote. The doing? Not so much. How are we going to handle it when the proverbial caca hits the fan? Because it is GOING to happen. It isn’t a matter of if, rather a matter of when. If we allow ourselves to be at the mercy of circumstances? We’re going to be miserable and we’ll never finish the blog or the book. We’ll give up, tap out and take every carb in the house down with us. Though I’m not where I’d like to be? I’m a hell of a lot better than I used to be. Making the decision to become a writer was the single best thing I could ever have done to grow my character, to mature me and to make me a better (not perfect) person. Successful people don’t avoid stress, they learn to manage it….often the hard way. Yay! A lot of why we make ourselves miserable and end up depressed is that our expectations fail to meet with what reality delivers. If you ever want to see this in action, just watch Bridezilla clips off YouTube. The bride has this absurd expectation of what the wedding day should be, an expectation that reality cannot meet (No, sorry, we cannot have cherubim deliver you to the altar on a cloud)…and they implode. A sinkhole forms around the bride that eats all the bridesmaids, the caterer, the flower girl…and the groom is just standing there like he’s just landed at Normandy. Expecting too much? Can be problematic. But we need to be careful about the other side of this emotional coin—especially those of us from crazy dysfunctional families. We can stray to the opposite side of the spectrum and that’s dumb too. Maybe we’ve gone through a lot, been let down a lot so we just expect nothing. Or worse, we expect bad things to happen. We expect to be let down. That is bad juju as well. Thus, there is this fine dance we must master between expecting great things, but also being prepared for everything to just go sideways, too. Going to let y’all in on a little secret. Lean closer. This will blow your mind. Publishing involves…humans. Humans who screw up, make mistakes, etc. Even better? Now that we’re in the digital age? Humans can screw up much FASTER and INSTANTLY. Sometimes things will go great. 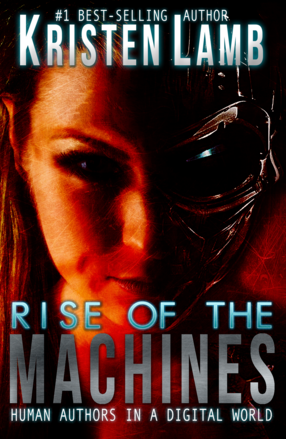 When I self-published Rise of the Machines? It was glorious. Beautiful cover, perfect formatting, not a single typo *gets cramp patting self on back*. Of course this was all run by Control Freak Perfectionist Kristen and I damn near killed myself doing it all on my own. That and Hubby wondered if he needed to bring me more coffee or perhaps toss holy water on me. See? Even I get rejected 😛 . But with all the family stuff going on the past few years (my husband ordered to deploy to Afghanistan, deaths in the family, sickness, Shingles, etc. etc.)? I just didn’t have the bandwidth left to push my novel for a legacy deal and still have passion and energy for this blog and classes, etc. Thus, the book sat and I just kept feeling inside that I needed to take that step. I needed fiction out there because 1) my original goal was to be a novelist 2) I have enough unpublished novels sitting on the hard drive, no need for one more and 3) I needed skin in the game. I can’t blog week after week challenging you guys to be brave…while hiding. To make a long story longer, I finally let go of my novel and handed it to a new indie press. I loved the cover. They did a great job proofreading it and I was really happy with the final version. My launch date got pushed up a week. Was supposed to be May 25th and instead it was May 16th but whatever, right? Roll with it. I pull up the sample pages on Amazon and the world drops out from under me. I have no idea what happened. Sun spots. Mercury in retrograde. Essential human error. Suffice to say the wrong version was uploaded. Better than that? An un-proofed version. Good news is a lot of people bought the book. Bad news? They bought the wrong one. Excuse me while I go shoot myself. The publisher immediately corrects the problem, but then Amazon takes their time and it was a mess. The correct version wasn’t syncing and BLARGH. It certainly was NOT how I envisioned launching my debut novel. There were way more typos and way fewer calls from Hollywood involving talks on an HBO series. Class, What Did We Learn? I’m a huge fan of failure. No I’m not high on anything, and trust me. If I have a choice between failing and winning? Winning always feels way better. But failure often can be better FOR us long-term. Then they go sprinkle one-star reviews on Goodreads like frigging fairy dust when they’re not trolling blogs. Yes, I do turn into Danny Trejo with an ax. And I’d love to say this would never have happened if only I’d been a Random-Penguin! Everything is perfect for legacy published writers. Right? Yeah, no. They have their own (albeit different horror stories) and one day I am sure I will have my own to share. See, a lot of bad things will happen to us in life and definitely in publishing. Often is it not our fault, but it is ALWAYS our responsibility. People will make mistakes. The mistake is not the core issue, rather what do they do to FIX it? And how do we handle it when everything goes pear-shaped? Obviously this is not me being laissez-faire about mess ups, but there is a balance. Yes, strive for excellence as a standard but also recognize there’s this inconvenient thing called reality 😉 . I was extremely blessed, namely because of this blog. A lot of fans messaged me to tell me my digital skirt was tucked in my digital underwear instead of hammering me with one-star rants. I was able to explain what happened and get them the correct version. This only happened (I feel) because 1) I had an established reputation for quality and 2) the fans I’ve cultivated here genuinely want me to succeed because of a long-standing relationship. ***NOTE: If you happened to get the wrong version, feel free to email for the correct one. Send a message to captivequillpress at gmail dot com and either a screenshot of the receipt or image of it on your device and include the email for your kindle. We will get you the correct version. Try stuff. When it goes pear-shaped? Examine it. Study. Learn. Try new stuff. Grow, improve, evolve. Get better, change tack. Wood moths did it and surely we’re as smart as a wood moth, right? What are your thoughts? Have you ever had something go so bad, SO sideways you thought you’d die just from the embarrassment? If so, comment and give us proof of life 😀 . A cover go wrong? Formatting that bit back? Amazon issues? Whatever it is! I like hearing from people who have failed because those are my kind of peeps! People brave enough to at least DO something and give it a go. LOVE hearing from you guys! Today, we welcome back author and Hollywood producer Joel Eisenberg for the kick in the pants ALL of us need. I have to admit, yesterday was an unbelievably bad day and Joel sent this guest post in early. In the midst of the flaming wreckage of my day, I didn’t get a chance to read the post until this morning and man, did I ever need this message. We all do. Every day. Tattooed backwards on our foreheads so we can read it when we look in the mirror. Okay, maybe that is a tad too far. But read on! And as always, thank YOU for being here and THANK YOU JOEL for being so generous to all of us. – a loved one in 2001, when I was discussing giving up on my dreams. You can have it all. Really, you can. To get there, though, requires all of the clichés: sacrifice, hard work, persistence, yada yada yada. It’s like this: There is no roadmap. Period. End of story. And yet, getting published or being produced as a writer is not an impossible dream. And therein lies the rub. Anyone who says they have discovered the roadmap is, frankly, deluded or a liar. There is no roadmap. Both the publishing business and the film or TV business is the wild west. There are no rules. Yeah there are books. Take a cursory look on amazon, or your local bookstore, and you will find dozens of volumes devoted to making it in your specific industry. But, you may ask, if I’m calling these efforts out, and yet I’m hosting a Kristen Lamb Masterclass myself – and years ago having written and self-published a book about surviving day jobs en route to the attainment of one’s creative goals – then wouldn’t I be a master hypocrite? Read on, and make that determination on your own. The greatest single mistake made by these sometimes-well-intentioned efforts is this: They assume everyone has the same path in life and they espouse their “rules” from there. Some aspiring writers have children to feed. Some are in school. Some have family responsibilities such as taking care of an elderly parent. Make no mistake. It’s you. Sometimes, we are our own worst enemies. We live in 2017. Take advantage. Years ago, one was asked to send a self-addressed stamped envelope to a publisher or production company, containing your query or bound volume of your latest masterwork. Today, most of this is done by email. But, what is more important is you can easily google lists of publishers or production companies who will read unsolicited manuscripts. Such listings will also explain how best to query your specific target. Frequently, you don’t even need an agent. Which brings me to the bane of the writer’s existence: The business of writing. In my experience, having spoken to tens of thousands of writers throughout the country for several years, and hosting multi-media networking events at Paramount Studios, Warner Brothers Studios, Sunset-Gower Studios and others for the better part of a decade – one thing is constant. Once a creative person takes care of, what would in our case be the writing of the material, many are lost when it comes to how to sell the material. This is perhaps the biggest reason why I am hosting a Master Class for Kristen. I’ve been in the trenches. I’m accessible and not at all foreign to being broke, having time issues and so on. When I became truly desperate is when I succeeded. You have to learn to sell yourself first. Join us and we’ll share with you specific strategies to work with what you have as an advantage to maximize your results. Remember, if there really was a magic bullet to all this, we’d all be doing the same thing and achieving the same results. That’s not even science fiction. What are your thoughts? Your stories? Your struggles? Joel and I are here in the comments so let’s TALK! And Joel and I have been where a lot of you are. It is why we have dedicated our lives to serving you and teaching you and making you better, so sign up for a class or five 😀 . We did the heavy lifting for you, so let us help you!